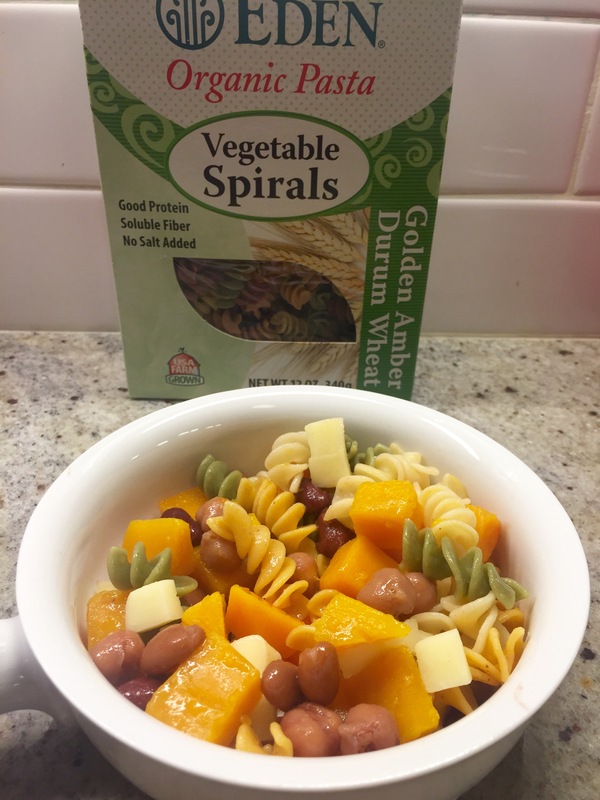 What: A colorful pasta dish using our new favorite product, Eden Organic Vegetable Spirals (Multi Colored Fusilli), and a pantry staple, Westbrae Organic Beans (the salad mix variety but any type will do). We love Westbrae because the cans are BPA free. When: Pasta is our go-to because our little guy loves it all the time. At 15 months, I think he prefers things he can grab with his little hands, and the fun shapes (remember how you used to love wagon wheels?) and colors don’t hurt either. Why: Because MULTI COLORED SWIRLY PASTA without the nasty artificial colors (Eden uses natural coloring such as Beet and Carrot Powder). How: Make the pasta ahead, crack a can of beans, chop some cheese up and, if you can, buy time-saving ready peeled Butternut Squash (but any squash or root veg will do). Chop it small and boil it for 9 minutes. Drain and add to the dish! Add the chopped Butternut Squash to a pot of water and bring to a boil. Allow to cook about 9 minutes until the bite-sized pieces are quite tender. This can be done in advance. Next, prepare Pasta according to package instructions. (Eden brand recommends cooking 8-10 minutes, and I feel 8 is ideal if you prefer it slightly toothy (as my little guy does). Open the Beans and rinse them briefly under water. Mix Squash, Beans, Pasta, and chopped Mozzarella in a bowl. Toss with a little melted Salted Butter OR add a few pinches of Salt. This will keep in the fridge up to 3 days.